The Burke-Gaffney Observatory imaged phi Piscium. Centred on TYC 1747 01532 1. This target is in the RASC Observer's Handbook double and multi-star table. It's been on my to-view list for a long time, over 3 years. Luminance only, 2 seconds subexposures, 20 stacked shots. FITS Liberator, Paint.NET. North is up; east is left. phi Psc aka 85 and Σ99 is a triple. The B star is to the south-west, very close to the primary. Bright but much less so than the host. C is well away and almost due south. Much dimmer. Further along is a slightly bright star, almost inline with C, but it is not related. The WDS says B was at 226° in 1832 at a separation of 8.0"; in 2012 it was at 221 and 7.8. Haas quotes the same numbers. 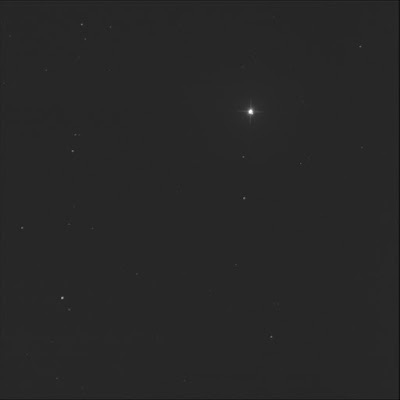 Far to the east, near the left edge of the image, is a separate double star: POU 113. Both in the duo are faint. B is to the west of A.